We’re all accustomed to watching home video footage where the picture shakes or goes blurry, and most of the time this is down to filming using the hand-held camera method and unless you’re perfectly still when composing your shots, the results can be very unpredictable. Tripods are very useful in creating stabilised and steadier images and offer you more control in your filming. Here’s the basic low-down on why and when it’s best to use a tripod in certain instances. One of the best reasons for using a tripod is that it allows you more time and thought to compose your scene. In other words, it forces you to stop filming and think about what you’re doing and what you’re hoping to get out of the scene. If you are filming people, it enables you to make eye contact with them so that they’ll pay more attention to you and you’ll then be able to direct them much better so that you can get the results you want to achieve. Filming interviews with people demands that the camcorder stays rock-steady, especially if the interviews are long. You should always use a tripod in these situations otherwise the importance of what your subject is talking about is lost as the viewers’ attentions are diverted to looking at the shaky images. When filming in dimly-lit locations, you can often get better results by using a tripod. If you wish to film a particular scene but find that you’re standing on uneven ground, this is going to be reflected in the visual perceptions of the images you shoot, which can look particularly weird if you’re shooting a landscape scene. 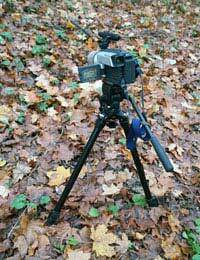 By using a tripod, you can compensate for uneven ground by adjusting one or more of the tripod’s legs. A well-secured tripod is a must if you’re filming outdoors in blustery conditions. If the weather’s bad and you’re using the hand-held method, not only will the wind blowing through your clothing cause an unwelcome addition to the sound quality, the fact that your body movements are likely to be affected by the elements too will cause even more jittery images as you try to cope with the effects of the wind. Events like school plays, weddings, graduations and sporting events look better on film if a tripod’s been used. This is not simply because the events are longer and holding a camcorder completely still for a long time is tricky, but with more people in the shots, filming them hand-held can often lead to pans and tilts which can make some of the subjects appear blurred which is hardly good news if those affected are the bride and groom or your young child in a school play. The beauty of filming these three subjects lies in the spontaneous movement and/or action that lie at the heart of this kind of filming. It may be an animal chasing down some prey. It may be birds flying down to a table to feed or it may be the spectacular vision and sound of a waterfall. What all three have in common is that the action comes from the movements (and sounds) on the screen from the subject itself and nothing is more off-putting than the ‘movement’ of the cameraperson as well. So, a golden rule when shooting video is to ‘film motion’ and not to ‘create motion’. More common when shooting wildlife or other landscape scenes, your tripod will come in very handy where you may want to film through crevices, rocks, etc. In other words, places where you won’t fit into but your camera and tripod might. And finally, don’t forget that you, too, might also be expected to feature in the video. And, whilst you can always hand over your duties temporarily to another person if you all want to be in a particular scene, a tripod is the best way of achieving that.